Sunil Reddy, who noticed the hacked trees, brought it to the notice of BBMP officials with the help of environmental activists. 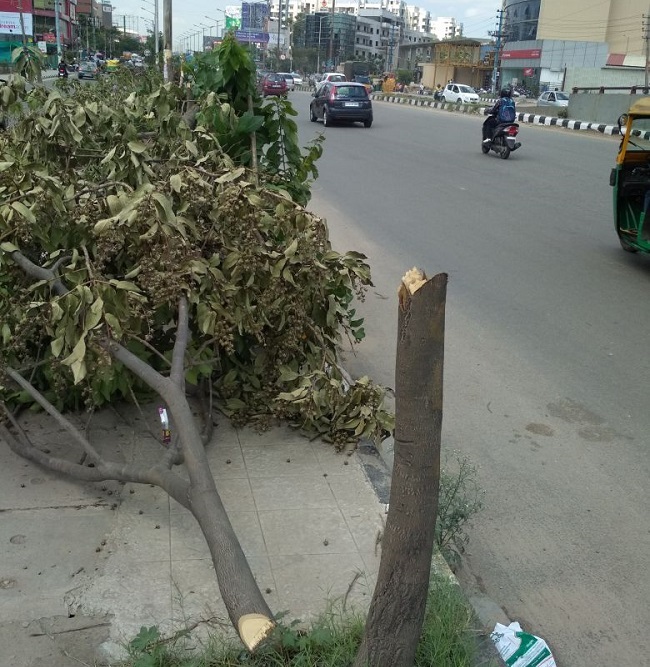 Tree butchers strike again in Bengaluru, and once again for the same reason -- to ensure that a hoarding is visible. Around 25 trees near Iblur junction were hacked to advertise a realty project -- Sobha Dream Acres. 36-year-old software engineer Sunil Reddy noticed the hacked trees on a divider about 100 feet away from the Suncity signal on the way to Marathahalli on his way to work on Thursday morning. He then took pictures of the same and posted it on his various social media accounts, and decided to bring the matter to the attention of BBMP officials along with the help of environmental activists. "Around 25 trees in this particular stretch were cut down, and it was evident that it was to ensure that the hoarding was visible as the rest of the trees were unharmed. We spoke to Shantha Kumar, the Assistant Conservator of Forests, BBMP Forest Cell. Since the officials were on election duty, he promised to take action in the matter on Monday," he said. G R Vijay Kumar, the Deputy Range Forest Officer of the BBMP told TNM: "Our official has gone to the site and carried out a preliminary investigation. We are currently trying to trace the agency responsible for the hoarding." Vijay said that an FIR would be filed soon and further investigation would be carried out on Monday. Trees being mutilated to ensure the visibility of hoardings is a rampant problem in the city. From poisoning trees with acid to haphazardly hacking branches, a number of cases of tree mutilation by advertising agencies have been reported across the city in the past. In April, eight trees that blocked the view of a hoarding in Mahadevapura were cut down. Vijay Nishanth, popularly known as the 'tree doctor', said that he would visit the site on Friday and treat the injured trees by applying liquid bandage and fungicide. Vijay noted that there has been a considerable decrease in the number of such incidents after the Lokayukta passed an order which enabled the forest wing of the BBMP to take down such illegal hoardings and even cancel the licence of the advertising agency. However, the environmentalist believes that the key to curbing such crimes lies in increased community participation. "It is sad that even educated people are insensitive to these issues and are poorly informed about handling such cases. Unless there is more awareness and increased involvement of the people, it is not possible to completely crack down on these cases," he said.